First of all, I apologise for the sheer lack of pictures in this post! I think I speak for all bloggers right now when I say, we're totally up against it with light at the minute, and I just couldn't get enough decent pics! Thankfully, this post doesn't require too many images, as it's all about making very small adjustments which ultimately make a huge difference. I've recently really fallen out of love with my bedroom. I think moving house and now having to share my room with a boy (ew), had taken its toll and our bedroom had become a bit of a mismatched mess. He hates florals and pastels (of which there were many - it looked as though I'd raided the whole of Cath Kidston previously), whereas I hate his love of dark woods and minimalism, so we had a big task on our hands (when I say 'we', I of course mean 'I', as he had no say in this whatsoever - ha!). My bedroom is a really important space to me, and it's always been a place I've taken pride in making look as pretty as possible. I love the fact I can retreat to my room, especially at this time of year, with a hot chocolate and a good book, and get snuggled up in the cosiness of it all. That wasn't really happening with how our bedroom used to be, so when Ocean Loans got in touch and said they'd like to help out and make a room more homely, I jumped at the chance. 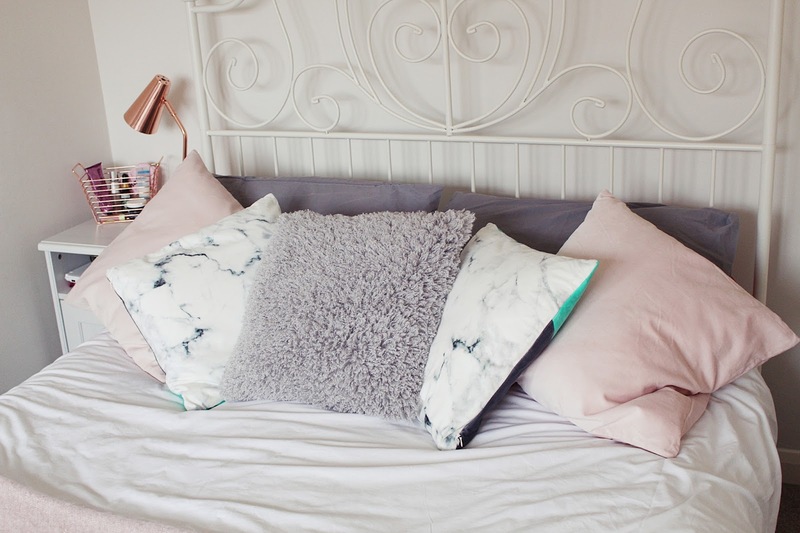 I'd been looking on Pinterest a lot and noticed I was constantly re-pinning interior posts featuring pastel pinks, whites, greys and coppers. I knew this was the route I wanted to go down for the bedroom (and Tom grudgingly agreed - hey, there are no florals here!) so I set about buying a few new things: a new duvet cover, pillow cases, cushions, blanket and bedside lamp. 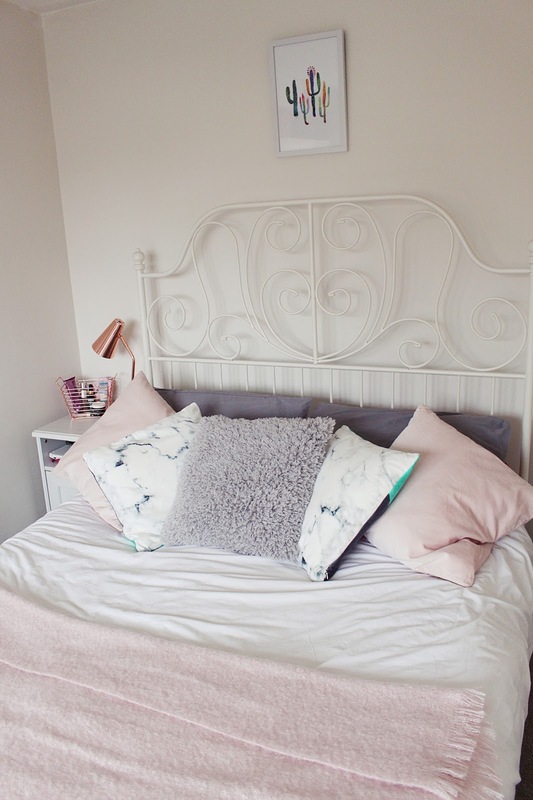 I wish I'd taken 'before' pictures, but basically I used to have a Cath Kidston-inspired duvet cover, mismatched cushions and pillow cases, and a shabby chic, vintage-inspired lamp which was lovely but just wasn't working for the vision I had in mind. So here you have it: my room post-makeover! I absolutely love it now - there are still a few things I want to do (we need new curtains, more prints and I feel like fairy lights are definitely necessary) but my cosy little book-reading area is pretty much complete. 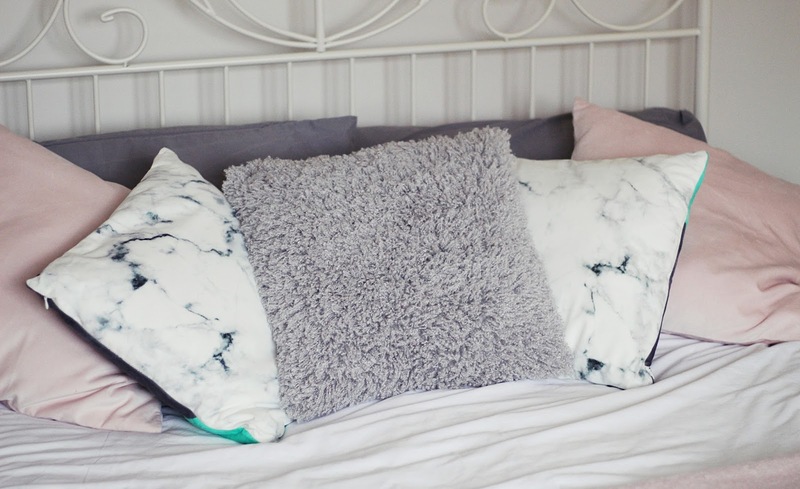 I chose a bedspread and pillowcases from Primark, as well as picking up the amazing marble cushions from a trip to the Tottenham Court Road Primark (£6 each - what a bargain!) and the copper lamp was a steal at about £14 from The Range. I loooove the copper wire basket with my beauty products in on my bed side table - it was from B&M and another absolute bargain. I feel like I needed something like this on my bedside table to encourage me to do my skincare every night, as I'm a very 'out of sight, out of mind' person. The super soft fluffy pink blanket was from H&M, as were the pale pink cushion covers, and the cactus print was another steal from Primark. I'll probably change the print to something else at some point but I actually really like how it looks at the minute! Finally, the uh-mazing fluffy grey cushion in the middle was from Wilko for a fiver! I'm amazed at how much difference just changing a few little bits in my room can make! Let me know if this inspires you to give your room a little mini makeover!